Detroit Red Wings Trade Deadline: Who's Staying, Who's Going? Red Wings Trade Deadline: Who’s Staying, Who’s Going? By the time the clock hits 3:00 p.m., the Detroit Red Wings will have completed their second consecutive trade deadline as sellers. Although they are five points back of the Columbus Blue Jackets for the second wild-card spot in the Eastern Conference, the writing is on the wall. They haven’t won more than four consecutive games this season and are likely headed for a second consecutive playoff miss. In 2017, the Wings had a plethora of rentals to shed. Tomas Jurco, Brendan Smith, Thomas Vanek, and Steve Ott were all shipped out for three 2017 third-round picks, two picks in 2018, and defenseman Dylan McIlrath. For what he had to offer, general manager Ken Holland did well for himself. This time around, Detroit has sexier assets to deal in addition to some depth players that need fresh starts. 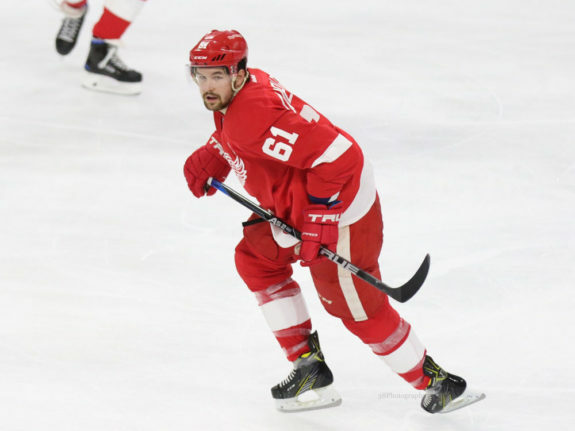 Mike Green, Gustav Nyquist, Tomas Tatar, Xavier Ouellet, Danny DeKeyser and Luke Glendening all appear to be in play with different levels of interest attached to them. 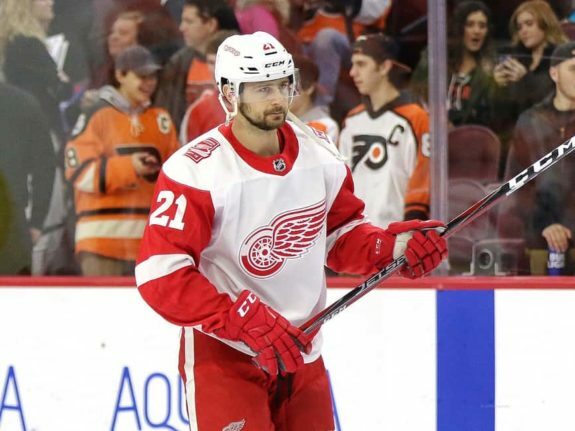 The team indicated its intention to sell relatively early on Feb. 19 when they shipped the apparently polarizing Petr Mrazek to the Philadelphia Flyers for two conditional draft picks. With Holland, it’s difficult to gauge who exactly will be on the move considering his approach to rebuilding the team. It won’t be a firesale, but he won’t be standing pat with a chance to recoup assets for the summer. Based on the leader of the brain trust’s track record and what’s been floating around on the rumor mill, here’s an honest prediction as to who will likely stay and go come this afternoon. This was thought to be a slam dunk from the start of the season, with Green’s contract set to expire on July 1. The Tampa Bay Lightning even came by to ring the doorbell with an inquiry in the weeks leading up to today. Until recently, they were considered the top suitor for his services. The hockey world changes rapidly these days. The 32-year-old blueliner has missed the past six games with a sore neck and his holdout before the trade deadline has not been precautionary. With this, Bolts general manager Steve Yzerman has switched gears and is reportedly about to set the world on fire with a possible Erik Karlsson deal. Ryan McDonagh has also joined the fray as a trade chip with Atlantic Division foes bidding for his services. Much of the Wings’ trade deadline plans will likely hinge on Green’s injury status. (Amy Irvin / The Hockey Writers). Despite the saturation of rearguards on the market now, Green does bring value at a cheaper price when healthy. He leads the Detroit blueline with 29 points and even though his possession rating sits at 48.06%, he is better suited in a top-four role and shouldn’t be logging 22:16 per night. Almost half of his scoring has come on the man advantage as well, indicating his fit as an offensive specialist. If teams strike out on the big fish, given the market the Wings could still net a decent return. Salary retention will go a long way in making a deal work, as that $6 million price tag is steep for teams that are up against the cap. The New York Rangers retained 50 percent of Rick Nash’s salary and the Montreal Canadiens followed suit with Tomas Plekanec, so Detroit may have to take on a number close to that rate to entice contenders. It all comes down to whether he’s good to go by Monday. If healthy, I’d expect the team to acquire at least a 2018 first-round pick. The alternative price should start at multiple high-round picks with a high-level prospect attached. Expect the Toronto Maple Leafs, Florida Panthers, and Columbus Blue Jackets to be in the mix in addition to Tampa if the reported Karlsson deal falls through. The winger market is heating up, and it’s a perfect time for Holland to dangle a 20-goal scorer with another year of control. The Nash deal has set the market for rental wingers with what the Boston Bruins had to pay. A 2018 first-round pick, a solid prospect (Ryan Lindgren), and a roster player (Ryan Spooner) were key pieces sent the other way. While the Wings would not get this haul for Nyquist, they could look at the Michael Grabner deal as a comparable. He ended up fetching a 2018 second-round pick plus a mid-level prospect (Yegor Rykov). The key for the Wings is finding a middle ground between the two transactions. The 28-year-old is playing his best hockey in years and will hit the 20-goal plateau for the first time since his 27-goal campaign in 2014-15. His cap hit is quite reasonable at $4.75 million and would give the acquiring team a legitimate top-six forward. Compared to Grabner and Nash, the Swede has more than held his own offensively since the start of the 2015-16 season. This campaign, the former fourth-round pick is only two goals behind Nash’s 18 and two points behind Grabner’s 31. He’s not as big of a hype-generator as the former Columbus Blue Jackets superstar or the swift finisher, but can still provide a team with some serious depth. 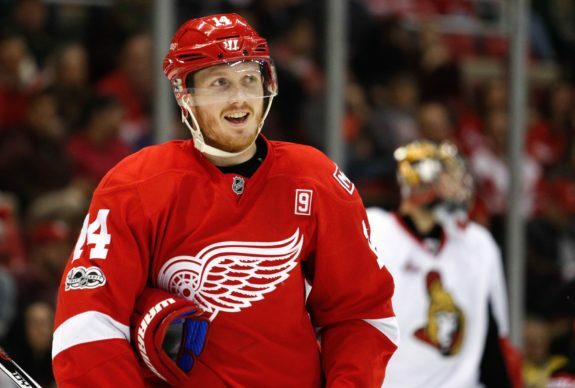 The Nashville Predators were reportedly interested in Nyquist’s services and general manager David Poile is always looking to shake things up. The Washington Capitals are a dark-horse pick with the Pittsburgh Penguins adding reinforcements, although salary retention would have to be a part of any deal as they currently have just over $500,000 in cap space. The Wings should start the bidding at a second-round pick with high-level prospect attached, marketing “Goose” as a cheaper alternative. In addition to the Predators and Capitals, the Dallas Stars and Anaheim Ducks could be good matches. The former squad is run by former Wings assistant general manager Jim Nill and the latter has an attractive crop of young blue liners in their system. Of course, his no-trade clause comes into play on any possible transaction. However, this shouldn’t be an issue given where the team is headed and the Cup hopes of the contender he could join. At this deadline, if movement occurs between Tatar or Nyquist, only one of them will get dealt. 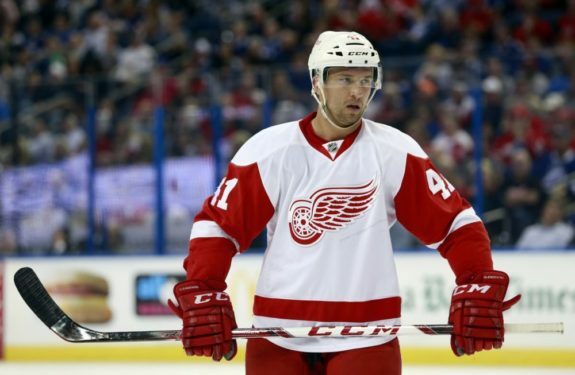 Despite heavy interest around the former, he will stay a Red Wing for the time being. The 27-year-old carries a $5.3 million cap hit for the next three seasons after 2017-18, which makes him an attractive scorer for a contender. He’s well on his way to another 20-goal campaign and has potted 25-plus markers in a season twice thus far in his career, the most recent time being 2016-17. He’s potted 16 markers and 27 points to go along with a 49.54% Corsi-for percentage in 2017-18. Since the start of 2015, he hasn’t reached the upper-echelon like some of the bigger names on the trade block. However, like Nyquist, on a better team he could bring value at a relatively less expensive price tag, hence the level of intrigue. The Ilava native does have a full no-trade clause that kicks in this summer on July 1, so the time to make a deal could come at this year’s draft. As highlighted in an earlier piece, the Red Wings have a sudden surplus of wingers making an impact with the big club and in the minors. 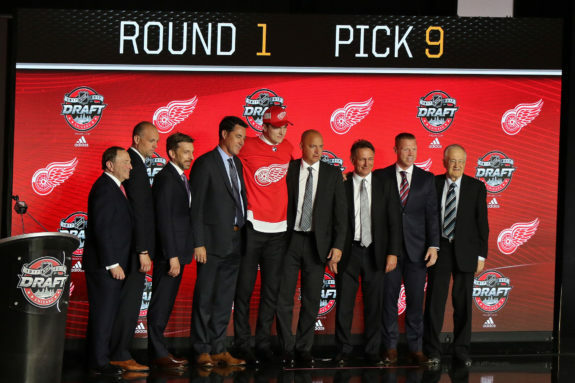 Anthony Mantha, Tyler Bertuzzi, Andreas Athanasiou, and Evgeny Svechnikov have given Detroit insurance and reason to collect assets for Nyquist and Tatar. For the latter, his time will come, but it won’t be today. In the offseason, many of the same suitors for Nyquist could also be fits for his long-time teammate. Before yesterday, there was a strong feeling that Glendening and Mike Babcock were about to reunite via a trade to the Maple Leafs. However, the Plekanec deal has all but squashed that possibility, and there hasn’t been much chatter on this front since the initial negotiations with Toronto. The Wings have stated that they will not give the Michigan product away, evidenced by their refusal to move him for the fifth-round pick the Leafs offered. At $1.8 million per season for the next three years, the 28-year-old’s pact is another in a long line of questionable deals that have wrecked Detroit’s cap flexibility. However, his character, despite the queued-up jokes, comes into play in trade negotiations. Tabbed as a shutdown center, the Grand Rapids native has started 67 percent of his shifts in the defensive zone. His Corsi-for percentage, in turn, is a dismal 44.11 percent, but his rate of 28.66 shots-against-per-60 minutes tops the team. He’s won 58.4 percent of his faceoffs, including close to 60 percent shorthanded, making him a go-to for crucial draws in late-game situations. Outside of a defensive role, he doesn’t offer much to write home about offensively. He’s scored just 8 goals and 14 points this season. Despite this, his kind is highly valued in the playoff scene as intangibles become magnified. However, with a shallow pool of suitors biting on what Detroit is asking for him, it’s unlikely he gets moved. Ouellet is stuck in a situation that mirrors Jurco’s from a year ago. The Bayonne, France native has suited up in just 39 games this season and has played in just 10 since Jan. 1. In contests he has participated in, his opportunity to make a difference has been quite limited, evidenced by his average ice time of 13:46 per night. Bruiser Luke Witkowski passed the 24-year-old on the depth chart recently, and it seems like he only makes an appearance when head coach Jeff Blashill elects to roll seven defensemen. Ouellet has posted just five assists but could be a cheap asset for a contender looking for blue line depth. The former second-round pick is under contract for one more campaign with a $1.25 million cap hit. Brandon Davidson, Michal Kempny, and Nick Holden were all recently dealt and each brought back at least a third-round pick. That seems to be the going rate for depth defensemen right now and it wouldn’t be the end of the world for Detroit to snag something similar or just below that value line. 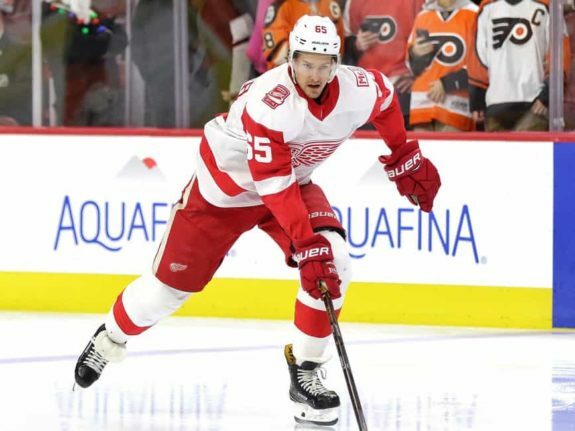 As for DeKeyser, teams have been calling, but movement seems unlikely given Holland’s passive approach and the blueliner market heating up with better options. The 27-year-old is under contract for the next four seasons at $5 million per campaign, and the pressure of that pact has likely hung over his head the past two seasons. Since the start of 2016, the Western Michigan product has posted a 47.11-percent Corsi-for percentage with just 9 goals and 20 points of total offense to show for it. He should not be playing 21:11 per night and is not a top-pairing defenseman by trade, but he does have the makings of a possible reclamation project at a reduced dollar amount. If the Wings were to retain $2 million like they did with Mrazek, the young defender would look more appealing for a contender looking to reshape DeKeyser’s confidence through the remainder of his deal. Many forget that in his first 223 contests, the Detroit native tallied three consecutive campaigns of 20-plus points to go along with a 50.59-percent combined Corsi-for percentage. He will not be moved by this deadline, but the team could get creative in the next few months. Predicting how a trade deadline is going to unfold with a passive-aggressive general manager is difficult, especially when his team is relatively close to the playoffs. Through 62 games, however, the Wings have long missed their chance to redeem this season and have not shown any signs of consistency. 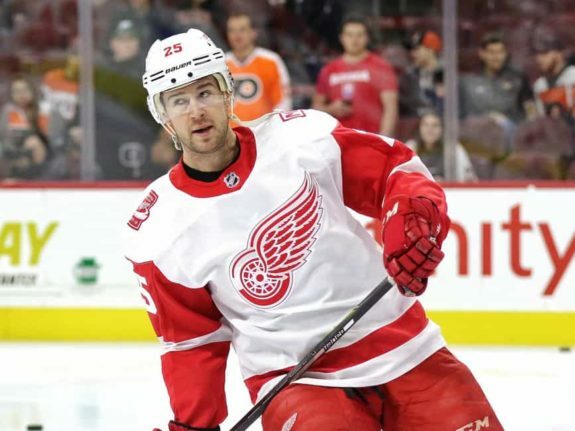 Holland has a chance to reaffirm his message delivered after the Mrazek deal, one that elicited signs of a team that will do what’s necessary to collect as many assets as possible for this summer and beyond. The assets are there. The prices have been set. The market is bubbling and ready to burst with transactions. Who ends up going is entirely within his hands. It’s going to be a fun stressful few hours.